The IceCube Neutrino Observatory, a particle detector buried in the Antarctic ice, is a demonstration of the power of the human passion for discovery, where scientific ingenuity meets technological innovation. Today, nearly 25 years after the pioneering idea of detecting neutrinos in ice, the IceCube Collaboration announces the observation of 28 very high-energy particle events that constitute the first solid evidence for astrophysical neutrinos from cosmic accelerators. "This is the first indication of very high-energy neutrinos coming from outside our solar system, with energies more than one million times those observed in 1987 in connection with a supernova seen in the Large Magellanic Cloud," says Francis Halzen, principal investigator of IceCube and the Hilldale and Gregory Breit Distinguished Professor of Physics at the University of Wisconsin–Madison. "It is gratifying to finally see what we have been looking for. This is the dawn of a new age of astronomy." Details of the research appear in a manuscript published in the Nov. 22, 2013 issue of the journal Science. Because they rarely interact with matter, the nearly massless subatomic particles called neutrinos can carry information about the workings of the highest-energy and most distant phenomena in the universe. Billions of neutrinos pass through every square centimeter of the Earth every second, but the vast majority originate either in the sun or in the Earth's atmosphere. IceCube, run by the international IceCube Collaboration and headquartered at the Wisconsin IceCube Particle Astrophysics Center (WIPAC) at UW–Madison, was designed to accomplish two major scientific goals: measure the flux, or rate, of high-energy neutrinos, and try to identify some of their sources. This is an artistic rendering of IceCube DOMs below the Antarctic ice. Inside IceCube, a total of 5,160 sensitive detectors hang from 86 steel cables. Credit: Jamie Yang, The IceCube Collaboration. 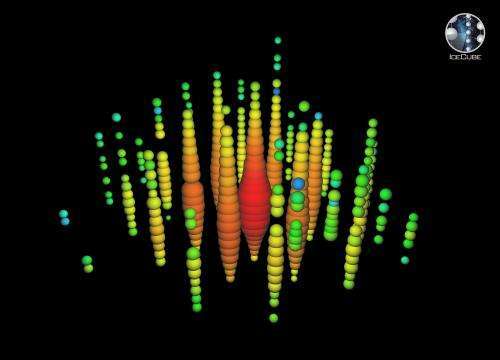 The analysis presented in the Science paper reveals the first high-energy neutrino flux ever observed, a highly statistically significant signal (more than 4 sigma) that meets expectations for neutrinos originating in cosmic accelerators. "From hints in earlier IceCube analyses, we have used improved analysis methods and more data to make a significant step forward in our search for the elusive astrophysical signal," says collaboration spokesperson Olga Botner, of Uppsala University. "We are now working hard on improving the significance of our observation, and on understanding what this signal means and where it comes from." "IceCube is a wonderful and unique astrophysical telescope—it is deployed deep in the Antarctic ice but looks over the entire universe, detecting neutrinos coming through the Earth from the northern skies, as well as from around the southern skies," says Vladimir Papitashvili of the National Science Foundation (NSF) Division of Polar Programs. "The IceCube Neutrino Observatory has opened a new era in neutrino astrophysical observations," adds Jim Whitmore of the NSF's Physics Division, who with Papitashvili manages operation of the observatory and the associated U.S. research projects. "It is in the forefront of the entire field of neutrino astronomy, now delivering observations that have been long-awaited by both theorists and experimentalists." 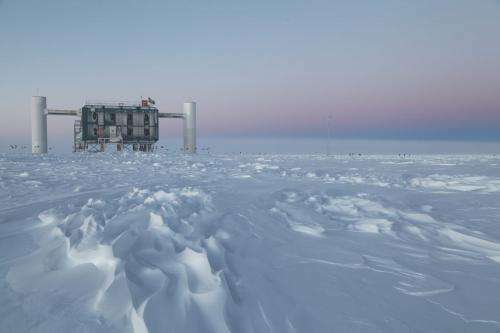 The 28 high-energy neutrinos were found in data collected by the IceCube detector from May 2010 to May 2012 and analyzed for neutrino events exceeding 50 teraelectronvolts (TeV) coming from anywhere in the sky. 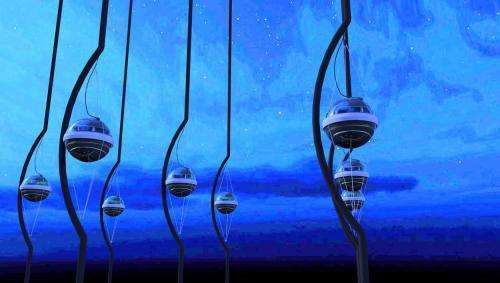 The events cannot be explained by other neutrino fluxes, such as those from atmospheric neutrinos, nor by other high-energy events, such as muons produced by the interaction of cosmic rays in the atmosphere. "Now that we have the full detector we have the sensitivity to see these events. After seeing hundreds of thousands of atmospheric neutrinos, we have finally found something different," Halzen explains. "We've been waiting for this for so long." "The success of IceCube builds on the efforts of hundreds of people around the world," says Botner. "IceCube collaborators made it all happen—from the design and the deployment in a harsh environment, proving the feasibility of the concept, to data harvesting and physics analysis. All required concerted efforts that ultimately have led to the observations presented in this paper. Now the collaboration is addressing a further challenge: how to make IceCube a big contributor to astronomy." Looking at the graphic shown in the free part of the article in Science, the graphic they show of the Cerenkov radiation flash detected from this ~ 10^15 ev neutrino looked to be at least 1/2 KM wide.